Let's face it, most people don't even know what their city's flag looks like. But, if you're ever in Chicago, you can't help but see that symbol of beauty proudly wave everywhere from buildings and bridges to bars and barbershops. Hands down it has to be one of the most beautiful flags ever created. But, don't take my word for it. 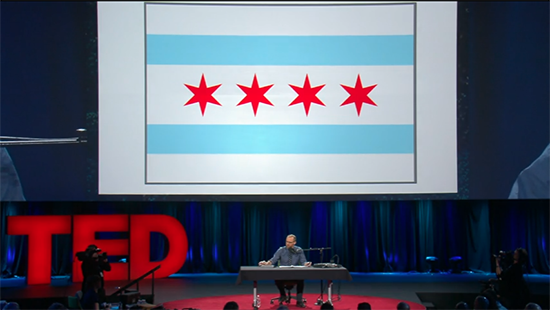 Roman Mars, presenter of one of the best Ted Talks I've ever watched, explains "Why city flags may be the worst-designed thing you've never noticed." Both highly educational and delightfully funny, this 18 minute talk about vexillology (the study of flags) goes into detail about the five basic principles of flag design and why he believes they can be applied to just about anything. So whether you're a budding designer or a dedicated Chicagoan, I highly recommend watching this enlightening talk about design and simplicity. It'll make you appreciate Chicago, and it's flag, a whole lot more.